KMRCL’s philosophy in executing this large project from its inception has been to keep safety paramount, not only for the users of the system, but also all the engineers and workmen constructing the corridor and also the residents of the city. An elaborate manual ‘Safety, Health and Environment’ (SHE) incorporating the relevant Indian and International guidelines has been adopted by KMRCL to ensure that the construction activities are safe for its workers and the people of the city. For the safety of the lives and building in close proximity to the construction, a Real Time Monitoring of building conditions it being done within the zone of influence (25 metres to 40 metres from the central line of tunnel on either side) using sophistcated instrumentation. This helps in taking appropriate precautionary measures for preventing/minimizing the extent of damage during construction of tunnels and stations. A Noise Level Assessment Survey has been carried out along the alignment of the elevated corridor to assess the requirements of mitigation requirements. In stretches where the elevated line passes through residential areas in Salt Lake, Noise barriers may be constructed to cut noise levels, if required. Passengers will travel in air – conditioned comfort; the coaches and underground stations would be air – conditioned keeping in view Kolkata weather. And the train operations would be controlled through a Operations Control Center at the Depot using sophisticated computerized system. Even video surveillance of the goings on in the moving trains would be beamed real time to the control centre! 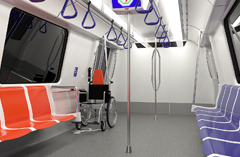 Platform screen doors/gates would be fitted at the edges of platforms in every station which will be aligned precisely with the train coach doors with which they would open and close in tandem. This feature would isolate the train track from the passengers at all times, maki9ng metro travel a very safe experience for all. All Elevated stations in t5yhe corridor are designed to cover life safety from fire and fire protection requirements conforming to National Building Code (NBC 2005)and West Bengal Fire &n Safety Act. All underground stations are compliant with NFPA standards for life safety from fire and fire protection requirements which stipulates that anyone at the remotest corner of the station should be able to reach a safe zone within 6 minutes in case of any exigency.